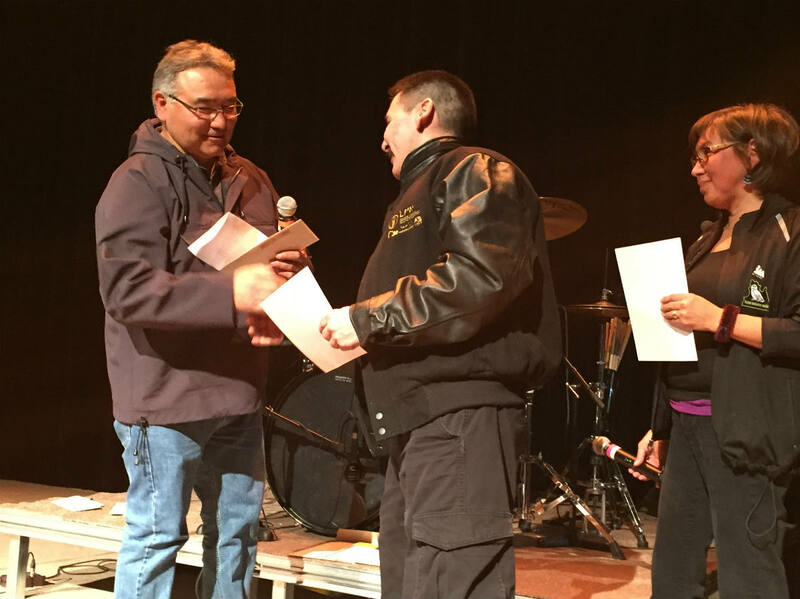 Paulusie Keatainak of Salluit receiving his certificate and check from Makivik President Jobie Tukkiapik and Maggie Emudlak Chair of KRG during Makivik's Annual General Meeting being held in Kuujjuaq March 23-27, 2015. Kuujjuaq, Nunavik-March 25,2015– At a gathering in Kuujjuaq last night 10 individuals were given special certificates of recognition and a $1000 cheque for their solid work ethics and dedication to Nunavik’s construction industry. The Inuit workers were able to accumulate 1000 work hours in 2014 in a short construction period. Wearing their Makivik construction jackets, the construction workers were congratulated by Makivik President Jobie Tukkiapik and Chair of the Kativik Regional Government Maggie Emudluk. Although this is not the first time Nunavimmiut have attained 1000 hours in a construction season, it is the first time there has been this many. In some years that number has been zero and in other periods it has been 5 at the most. Makivik Construction is proud of these individuals and view them as role models for other Nunavik Inuit planning to work in the construction industry. Button to download a .PDF file of this document.